LOCATION.--Lat 40`04'56", long 76`43'13", York County, Hydrologic Unit 02050306, on left bank 500 ft upstream from bridge on State Highway 181, 0.6 mi downstream from Little Conewago Creek, and 1.5 mi north of Manchester. 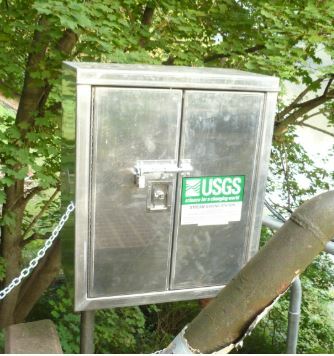 On Sept 13, 2017 the gage was relocated to Lat 40`04'50.9", long 76`43'6.21" referenced to North American Datum of 1927, York County, PA, Hydrologic Unit 02050306, on right bank 80 ft upstream from bridge on Stage Highway 181, 0.7 mi downstream from Little Conewago Creek, and 1.5 mi north of Manchester. PERIOD OF RECORD.--October 1928 to current year. Prior to October 1931, published as Conewago Creek near Manchester. GAGE.--Water-stage recorder and crest-stage gage. Datum of gage is 263.68 ft above National Geodetic Vertical Datum of 1929.